A few weeks ago, I got an email from Anthony Pizzitola, a Houston autograph collector. With the 50th anniversary of the Kennedy assassination coming up, he wanted to share a particular item from his collection with me. I wrote about Pizzitola last year, after the death of astronaut Neil Armstrong. Pizzitola wrote a book about Armstrong’s autograph, among the most sought-after signatures in the world, and he has an extensive collection of them. His collection, though, is far more extensive than just astronauts. He often tries to get famous people to write a quote they’re known for above their signatures. 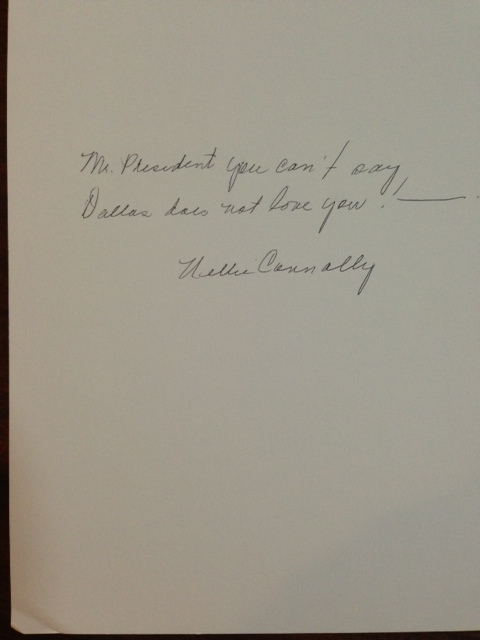 He sent me the image above — the autograph of former Texas First Lady Nellie Connally, under the words she spoke to President John F. Kennedy moments before he was shot. They were probably the last words Kennedy ever heard. I was familiar with the quote, but seeing it written in Connally’s own hand gave me chills. Pizzitola said he wasn’t sure how Connally would react when he approached her at a book signing in 2004 and asked her to write the words. She simply commented that no one had ever asked her for that before and honored his request. I’m not the only one who found this story interesting. The Houston Chronicle’s Kyrie O’Connor wrote about Pizzitola and his collection today as well. This entry was posted in Other Thoughts and tagged Assassination of John F. Kennedy, autograph seekers, autographs, history, Houston, John F Kennedy, Kyrie O'Connor, Neil Armstrong, Nellie Connally. Bookmark the permalink. Well I bet He will never hear Her say that again.